I met Edith Lecoq in a wonderfully peculiar way. I was in the Jardin du Luxembourg last month taking photos of the beautiful Queen of France statues surrounding the park. I went to shoot St. Genevieve but there was a circle of about 15 women in lawn chairs having a picnic surrounding the statue. I politely asked one of the women if she could move her chair a little so I can get my shot. She said of course and asked me if I would like join them for some coffee or some food. I never turn down free food, so I said yes and proceeded talking to this group of lively women for the next 45 minutes. They immediately made me one of the group and insisted that I have a piece of birthday cake, as it was one of the group members birthday. They told me it was a group that they belonged to called Voisin a Voisin, where they would gather once a week for different events like tea at a café or a book club. 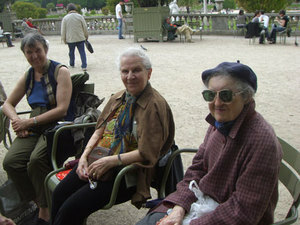 This was their annual picnic at the statue of St. Genevieve and I felt honored to be included. Edith Lecoq is the organizer and founder of the club. She handed me her card and her title was events producer for the Mairie (city hall) of the 6th Arr. In case you didn’t know but each arrondissement has its own mayor and city hall. She told me that she started the group of primarily female senior citizens, most widowed or living alone, because many of them were sometimes lonely and it was a way for them to socialize and make new friends. I was impressed with Edith’s idea and thought she would make an interesting Parisian of the month. The following week I went to her office in 6th arr., located in the stately Mairie on rue Bonaparte. 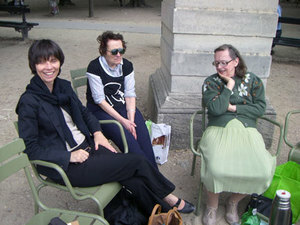 Edith warmly greeted me and we sat in large exhibition room overlooking St. Sulpice square. She has had her job for 27 years and still loves it. Her husband is the mayor of the 6th arr., so they work closely together and thankfully he’s agreeable to most of her ideas. Sometimes when he says an idea of hers is too much, it’s only because he thinks it will take too much of her time and not leave enough quality time with their family of five. She has free reign to pick her events and she never knows where her inspiration will come from. Six months ago she met musician Elliott Murphy, one of the great old time American rockers that has collaborated with Bruce Springsteen, Billy Joel, and Phil Collins, who loves Paris and keeps an apartment here. She invited him to give a concert at the Mairie and he accepted. The free concert is scheduled for Friday, September 26th at 9PM.To support a neighborhood hat maker Marie Mercie, an exhibition of her hats photographed by Anne Roman will run from September to September 15. One of her pet projects is a series of Saturday event with various themes including a jazz festival in October, a Feydeau play in December, and an event celebrating Chinese culture in January. In March of 2009, she is organizing a classical concert with four women playing the flute and an exhibition of what kind of lipstick women love to wear to celebrate international women’s day. Her personal favorite event is One Book, One Café where a noted author reads from one of their works to an invited audience in a café on Blvd. St. Germain. Edith is a native Parisian. I asked her what was most special thing about the 6th arr. and she profusely spouted the following list: good living, pleasant life, great architecture and culture, an international community of interesting people, and the heart of the history of Paris and France, where you can smell and feel it. Edith Lecoq is passionate about her community, family, and culture and I think most proud of being a Parisian. Here's to the ladies who picnic. Aren't they the best! It was a nightmare being on a tour bus, it overheated and broke, it was suggested we find other means of transportation or wait God knows how long for another bus. In a nutshell, I hailed a cab NY style. I will bookmark your website. Good stuff! Your life is so cool! I wrote you a fan letter some months ago and every day I look forward to my Eye Prefer Paris fix, reading about your adventures...and they are adventures. I need Paris like I need air. So, thanks again for all your lovely photos and tales. They keep my spirits up til I get back there. richard, I absolutely love this post. Just great reading about Edith and what a vibrant, interested and generous person she is. You always seem to meet up with the greatest people... which speaks worlds about you. What a great story! You seem to attract good things.